Marco and I are both very much into our food and love going out to fancy restaurants from time to time, but I don't think we ever even considered a 3-course sit down meal for the reception. In keeping with the fun and relaxed atmosphere we aimed to provide for our guests, we always wanted there to be a buffet, ideally with a barbecuing element, so that everybody could serve themselves when and what they wanted. We booked our venue inclusive of the catering, and luckily, the chef and event coordinator were very accommodating. We had a big balcony outside the function room, so that a barbecue was possible and exactly what we ended up with. Meat and fish fresh from the grill and a cold salad buffet. The kitchen staff suggested canapés and what would be good to cook, but they also agreed to recreate some of our favourite salads for us. Clean and roughly chop the veggies. Place in a roasting tray and toss with half the olive oil and lemon juice. Season with a little salt. Put everything into the preheated oven and roast for about 20 minutes, which should just soften the vegetables. Take the roasting tray out of the oven when done and set aside. While the veggies are roasting, add the lentils to the slightly salted water in a large pot. Bring to a boil and then simmer, covered, until all the liquid has been absorbed and the lentils are tender. This will take about 30 minutes. 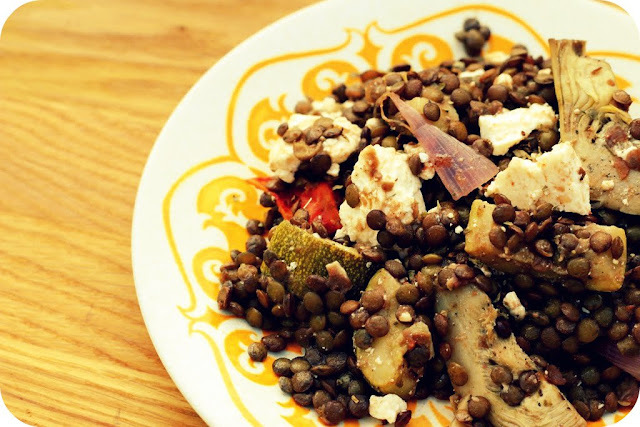 While still hot, fold the lentils through the roast vegetables. At this point, also add the artichoke hearts and the remaining oil and lemon juice. Season generously with salt and pepper and leave to cool slightly. After the salad is no longer hot, crumble the feta cheese over it all and also tear and add the basil. Mix through and serve still slightly warm or at room temperature. mmm, i love lentils artichokes!